Federal duck stamp price should increase for 2010. It is a memory jarred loose by time. I had been out of college long enough to have a Brittany spaniel, and the two of us were cruising the Iowa prairie, looking for a place to hunt. There wasn't much with feathers we didn't pursue in those days -- Britt was a good water dog with an enthusiasm for retrieving -- but as I recall, we were looking for pheasants that morning, not ducks. At the time, the Midwest was languishing between the Soil Bank and Conservation Reserve Program, which meant every square foot of available cropland was planted in corn or soybeans. That November morning, nothing was left in the fields but sparse stubble and bare ground, the kind of landscape where even the field mice had to carry lunch buckets. We loafed along the section roads, me behind the wheel, Britt riding shotgun, hoping to find a piece of cover worth asking about. As the hours passed, it became clear private coverts were going to be hard to find. I had just about resigned myself to hunting a state wildlife area when Britt's ears perked up. A hen pheasant on the gravel ahead of us slinked into a patch of native prairie on the west side of the road. In a futile effort to fool her, I continued down to the section corner before I stopped. Holding the dog back with one hand, I reached for my vest with the other, and then turned Britt loose while I uncased my Model 12. Britt disappeared into the grass, and I followed past a small metal sign emblazoned with the flying Canada goose of the national wildlife refuge system, but in green, not blue. It read, "WATERFOWL PRODUCTION AREA: OPEN TO HUNTING." It didn't cover much more than 100 acres, but it was the only wild place for five miles in any direction. A dozen mallards swam on the pothole in the middle, and Britt pointed three hen pheasants on our way to the interior corner. There, next to the last fencepost where the grass gave way to a fall-plowed field, he pointed one last time, and a rooster jumped wild up ahead. That moment, the bird like molten copper over the wine-colored patch of bluestem, is what cemented the memory for me. I don't remember the year or where I was living at the time or even whether the rooster died or not, but the light, the smell of the cured prairie grass, and Britt's high, hard point are with me still. My affection for waterfowl production areas began that morning. Nearly 7,000 WPAs dot the United States, a constellation of small marshes scattered over the farming country of the northern prairies. The typical WPA covers less than 100 acres, but the system of WPAs covers almost 700,000 acres, providing critically important cover, not only for puddle ducks, but also for upland birds and hundreds of nongame species. We bought those places, you and me. We're the third and fourth generations of waterfowlers who live up to a commitment made in 1934 when the Migratory Bird Hunting Stamp Act became law. The duck stamp was intended to deal with two problems: the ongoing loss of waterfowl habitat and the growing demand for places to hunt. 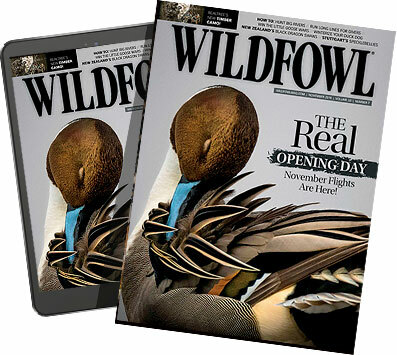 Since the first duck stamp was issued at the price of $1, sale of duck stamps has raised more than $700 million, which has been used to buy 5.2 million acres of habitat -- including WPAs -- that has been added to the national wildlife refuge system. But we're not buying nearly as much habitat as we once did. The price of the duck stamp has been frozen at $15 since 1992. Stamp sales have raised between $20 million and $25 million a year since then, the income fluctuating as the number of waterfowl hunters changes, which usually reflects changes in the number of ducks. Duck stamps were designed to impede the loss of waterfowl habitat. Since 1992, the price of an average acre of farm ground in North Dakota has increased from $335 to $770, roughly 230 percent. South Dakota land prices have risen nearly 340 percent; Nebraska prices, by almost 260 percent; Minnesota ground, 326 percent; Montana, almost 400 percent. A dollar of duck stamp money doesn't go nearly as far today as it did in 1992. At the same time, the assault on waterfowl habitat in the prairie potholes has intensified. In 1992, North Dakota farmers had about half a million acres of land in corn and no acreage in soybeans at all. New hybrids and genetically engineered crops changed that. By 2007, corn occupied 2.3 million acres, and soybeans, nearly 3.1 million acres. Many of those new acres were carved out of native prairie, some of the continent's most productive waterfowl nesting habitat. Biologists in the pothole country frankly admit the nesting habitat we save in the next decade might be all of the habitat we'll ever have, which makes the shortfall in duck stamp purchasing power particularly frustrating. A couple of years back, congressmen Mike Thompson of California and Don Young of Alaska co-sponsored a bill to increase the price of the duck stamp to $25, but it died in committee. Last April, Rep. John Dingell of Michigan and Rep. Robert Wittman of Virginia introduced a similar bill, calling for a $25 duck stamp in 2010, and with an increase to $35 after 2020. Paul Schmidt, assistant director of the U.S. Fish and Wildlife Service, made these observations when he testified in support of the bill before the House Subcommittee on Insular Affairs, Oceans and Wildlife: "The Service estimates that an increase in the price of the duck stamp to $25 could result in an approximate $14 million increase per year over revenues generated at the current $15 per stamp price, and the price increase could provide important increases in acres of habitat protected. Based on previous years' acquisition efforts and current trends and projects, the Service anticipates that the increased revenue could allow the Service to permanently protect an estimated 10,000 additional acres in easements and an additional 6,800 acres in fee-per-year across the nation." hile the subcommittee went on to consider other pressing issues. In the world of organized religion, congregations voluntarily tithe their members to support the church and its good works. The congregation of waterfowlers isn't much different. Over the decades, we've tithed ourselves to sustain North American waterfowl and to set aside places where the average hunter can pursue them. It's important work, the kind of effort that makes you feel good about contributing. The challenge now is to get the Dingell bill off of the shelf. Congresswoman Madeleine Bordallo chairs the Subcommittee on Insular Affairs, Oceans and Wildlife. A few friendly inquiries in her direction might be enough to get H.R.1916 off the shelf and put more duck stamp money on the ground.